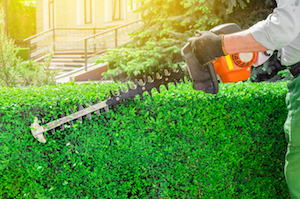 Cleaning up your property for spring is no small undertaking. Muddy grounds, salt residue and other remnants of winter are an eyesore and can seem overwhelming when deciding where to begin your spring cleanup. At Turfscape, we can handle it for you. Our team is well-trained to keep an eye on your property for safety hazards or necessary upgrades so you can enjoy a beautiful, season-ready property while concentrating on other aspects of your facility. Spring commercial landscaping services all complement each other. It’s hard to do one without the other if you want a proper-looking landscape. We focus on the following commercial landscaping services for spring that will leave a lasting impression on your visitors. Our crews are looking for any debris that has accumulated throughout the winter, including sticks, leaves, pine needles and pine cones. We will also clear any debris that has gathered on hard surfaces like driveways, sidewalks and parking lots. We prep beds for mulch installation and mulch cultivation. Proper bed edging around trees and flower beds keeps grass from penetrating a garden and gives properties a clean, beautiful look. Neatly edged tree beds and garden beds cleanly separate mulch and grass, making sure that they both stay where they belong. One of the toughest things to control in landscaping is the presence of weeds. The key is to prevent them before they happen. Using a pre-emergent herbicide is the most effective way to control weeds. Pre-emergent herbicides kill the weed permanently and are less labor-intensive. Dormant pruning is often more aggressive than maintenance pruning, with larger cuts being made to create more vigorous growth in the spring, which leads to a healthier shrub or tree. Our dormant pruning occurs from late November through mid-March. Throughout this season, landscape plants have entered their dormancy period. This time of natural hibernation allows us to prune with great detail, all without jeopardizing the health and vitality of your plants. There are many reasons for applying a new base of mulch every spring. Apply mulch to aid in the health and vigor of plant material, assist in weed control and enhance the overall perception of the landscape’s greenery. Turfscape applies mulch at a depth of 1.5”-2” in predetermined areas. We recommend applying a new base of mulch from mid-spring to mid-summer. To help with spring green-up and to control the germination of crabgrass and broadleaf weeds, we apply pre-emergent weed control with a balanced turf fertilizer. Snow plow damage is going to happen throughout the winter. Whether it’s placing back those loose pieces of grass or soil and seed repair, our crews repair any winter plow damage that has occurred. Your outdoor grounds must make a positive first impression on your clients, prospects, vendors, employees and executives. Preparation in springtime leads to gorgeous grounds throughout the year. Contact us to learn more about our commercial landscaping services for spring. Brandon Kugler is an Account Manager at our Twinsburg branch. In his role he focuses on customer & employee relationships along with renewals, enhancements and quality of work performed on the properties he manages. Outside of Turfscape he enjoys working on project cars and fishing, biking & hiking with his family.